If you are a member of Angie's List, please check us out there, too! "Mike was prompt, polite and informative. His product is excellent as well as his price and quality of work. He cleaned up when he finished the job and left everything nice and neat. We recommend him to anyone who needs a garage door and/or an opener." "Great job, very professional and clean. And best of all I had the door fixed within 24 hrs of going on internet." "Great job, fair price, quick service, answered all my questions, professional, knowledgeable"
"Excellent service, prompt, a true pro. Would hire again." "Prompt response in getting the estimate. Work was completed in a timely manner and they cleaned up after the project was completed. Thanks Mike." "I had a car speed by and hit my trash can into my garage door. This caused extensive damage to the hinges and eventually broke the spring. He was able to replace the spring and repair the hinges quickly and at a very reasonable price. I would highly recommend A Complete Door Service to anyone. Thank you very, very much." "Fantastic job. I thought I might have needed an entire door and hardware replacement, but he noted that only the rollers and cable were needed and didn't try to sell me anything additional. Gave me a great price and was ultra convenient to work with. Highly recommended." "Mr. O'Dea did an excellent job. He was very professional and courteous. He explained every detail before he started repairing the garage. I would recommend him to others. Great Job!" "Prompt on appointment, good price and neat installation. Very Good results. Much better price and no first visit fee of $50..00 as the big box stores charge." View us on Angie's List podcast. "A Complete Door Service was great. Michael showed up on time, was very friendly and knew how to fix my door. I would surely recommend him to anyone with a garage door problem." "They did a great job and showed up on time!" "Mike did a great job! Prices were great and was done in no time. Would use him again for all my residential and commercial work needed!" "I had a very positive experience, would highly recommend A Complete Door Service. I found the service to be very thorough and at a reasonable cost, thanks." "Triple AAA experience. Mike was very cooperative with my change of schedule, on the day that he and his associate came to do the work they were both very polite, helpful and informative." "A Complete Door Service was the ONLY one of the three businesses that called me first before I had a chance to call them. Of the other two companies, only one called me back after leaving a message. Mike came out and gave me an estimate and walked me through all of my options. The gentlemen who performed the work, Mike and Chris, were professional and very patient. I watched them put the door in and they answered all of my curiosity questions without an attitude. They said they would be at my home by 10:30 am and they right on schedule. The clean-up was amazing and I have actually referred two people to them already. Thank you!" "On time. Got the job done, Cleaned up work area. Doors look and work great. Nice guys!! What more could you want?" "Mike applied to my request within seconds, scheduled the appointment, showed up when expected, did a prefect job on the repair, and charged a reasonable price." "Mike at A Complete Door was excellent. He certainly over delivered on the work that he quoted us on. I wish I had more contractors with his attitude and work performance." "I was very pleased with the initial interview. His suggestions and pricing were right in line with what I'd hoped. Mike and his partner went well beyond the call of duty in installing the door professionally, and efficiently. The door itself is great! And their additional help in sorting out the door area was nothing short of miraculous. Thank you guys!" "I'd like to say thanks to Mike at A Complete Door Service. Mike provided us with a quote, came out and did the work and cleared away the old door. They were friendly and professional. I would recommend them to anyone needing service." "Very competetive pricing...super fast, quality work!Thanks alot! AAAAA+++++++++"
"Everything was great. I left a message for Mike and he returned my call promptly. He asked if I needed to get a car out of the garage (it was Saturday), he would have come then to do it. He came by the next day, gave me an estimate and did the work a few days later in a professional and kind manner." "Responded immediately and came next day. Had the best price around and work was completed as expected. I would definitely recommend A Complete Door Service to anyone." 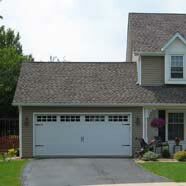 "Mike was prompt and was very good at helping my wife and I identify the best option for our garage door project. His work was neat and he made sure that the area was cleaned when he was done. Lastly, he was very knowledgeable, honest and personable which made the whole process a good experience." "Mike called very promptly and followed through with an estimate in person. He was thorough and knowledgeable. Once we scheduled the replacement door and opener, he was on time — calling before he arrived which I appreciated very much. I had picked out a garage door color which he felt would not complement our home. He was gracious enough to return that door and bring a second door which was a perfect match. It would have been a real disaster had he installed the first door so his going the extra mile to return that door and suggest the one he eventually installed was wonderful. I would recommend him to anyone." "I was extremely impressed with the service. I had a business trip out of town that I needed to get to but could not leave with my garage open. Mike understood my situation and understood my need — to get the garage down. He went out of his way to not only get it down but he fixed the overall problem in less than 30 minutes. He did such an excellent job that I have contracted him for additional services."